Hotels-New-Zealand is a group of independently owned and non-related hotels, motels and serviced apartments providing accommodation located across Mount Cook New Zealand. Hotels New Zealand allows you to deal directly with the hotels giving you the best possible rates for these Mount Cook hotels. 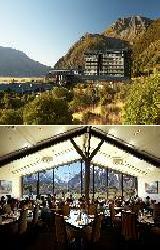 Book your accommodation online directly with the hotels in Mount Cook and save !!! Nestled beneath the towering peaks of the mighty Southern Alps, the 4 star luxury Hermitage Hotel is a gateway to an extraordinary alpine wonderland, the Mount Cook (Aoraki) National Park, a World Heritage Park. Situated amongst stunning scenery, including spectacular views of Aoraki Mount Cook and the surrounding World Heritage area, makes the Hermitage Hotel an absolutely stunning holiday destination. The Hermitage Hotel in Mount Cook has numerous guests facilities and services including lounge bar, business centre, child minding, conference centre, direct internet access, faxing facilities, free car parking, guest laundry, lift, restaurant, secretarial services, tennis court, tour desk, garden, 24 hour reception, babysitting service and daily housekeeping. Explore the village on foot or by mountain bike - there is certainly plenty to do in Aoraki Mount Cook National Park. The stunning alpine environment and range of accommodation, dining and leisure activities make The Hermitage Hotel one of the world's most spectacular holiday destinations. The YHA Mt Cook backpacker hostel is ideally located on the road between Queenstown and Christchurch and offers relaxed and homely accommodation after a busy day enjoying the majestic beauty of New Zealand's tallest mountain Aoraki Mt Cook. This spacious backpacker accommodation has central heating throughout, a cosy fire, free sauna and comfortable rooms that will ensure a good night's sleep in the natural surroundings of Aoraki Mount Cook. During the summer months guests can make use of the BBQ and picnic area outside and breathe in the pure New Zealand mountain air. The friendly and knowledgeable staff at the YHA Mt Cook hostel can book any of the local tours which provide activities around Aoraki Mount Cook and the central South Island region. The Glentanner Park is set amongst a working sheep station on the shores of Lake Pukaki and just 18km from Aoraki / Mount Cook National Park. 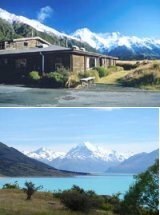 This Mount Cook holiday park offers affordable accommodation including self contained motel style tourist cabins, standard cabins, basic cabins, backpackers, campervan park and camping sites, all with panoramic views of Aoraki / Mt Cook and Mount Cook National Park.